In this New York Times bestseller, a naturalist probes the forest to comprehend the secret lives of owls. 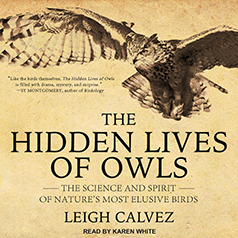 Leigh Calvez takes listeners on an adventure into the world of owls: owl-watching, avian science, and the deep forest—often in the dead of night. These birds are a bit mysterious, and that's part of what makes them so fascinating. Calvez makes the science entertaining and accessible while exploring the questions about the human-animal connection, owl obsession, habitat, owl calls, social behavior, and mythology.